Canonburycreations: Less is More week 25 "ribbon/button or both"
Less is More week 25 "ribbon/button or both"
Lovely cards as usual from Lady and Diva LIM, I'm always inspired by the tips and techniques that they share with us. Anyway on to my entry this week, I decided to use some alphabet stamps from The Stamp Man and do another Christmas card! I stamped the letters and coloured them with promarkers and used glitter to outline the shapes. They are mounted on gold mirri and the ribbon is from Meiflower. Of course I had to use a button:) which I overstamped and threaded purple cord through. Wpw beautiful colors and love that NOEL!!!!!! Great job!!!!! I love those alphabet stamps Valerie.... what a super card. LIMettes are psychic you know... so many seem to pre-empt our upcoming challenges by submitting a suitable card in the previous week! Odd or what! Mandi and I often have smile when we spot them! My card last week would've been just right for this week too Val! 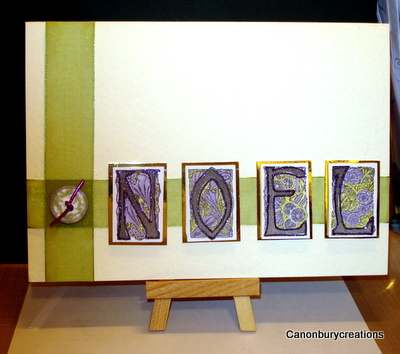 I love the stained glass effect letters on your card and the criss-crossed ribbon is fab with its button embellishment. What an elegant christmas card Val... love how you have also placed your button. What a great card in non traditional Christmas colours - I LOVE IT! Great card Val. Love the colours and the alphabet is great. Looks like you're putting your mini easel to good use too. A lovely dynamic card, love those alphabet stamps and the gorgeous colours you have used. The ribbon is such a stunning colour too. Hola Valerie, i'm glad to see you in my blog. Very different and elegant card for christmas, i love all different!fantasctic stained glass effect on your letters, beautiful ribbon.Good job. I really really like this.I think it's the rich colours and those brilliant letters. Stunning Christmas card, such a lot of work, must be for someone special. Wow! I love the whole design. The colors are so rich and it is very elegant too!